Carefully place two spoonfuls of beans in the bottom of each cup and carefully spread into the bottom of each cup using the back side of a spoon making an even bean layer. Mix the dip mix into the sour cream and carefully place a couple of spoonfuls of the ranch dip on top of the beans. Spread to make an even layer. Repeat the above process creating a layer with the guacamole followed by a layer of the salsa. Top each cup with a tbsp of shredded cheese followed by tomato, green onion, and olives. Refrigerate until serving. Mix the beans and salsa together and spread into the bottom of an 11 x 7 dish. Follow with a layer of the guacamole, if desired. Combine the sour cream and dip mix until combined and spread as the next layer over the guacamole. Sprinkle with cheese followed by tomatoes, green onions, and olives. Recipe adapted from The Girl Who Ate Everything. 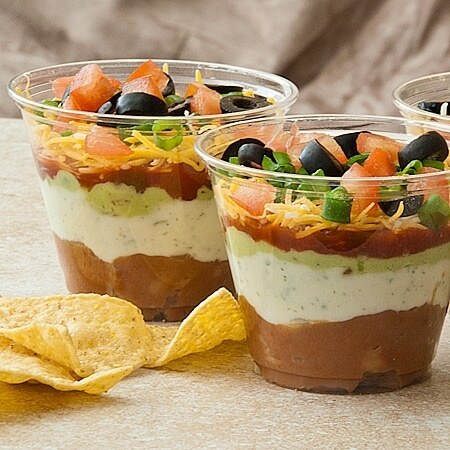 Will you try this version of the Seven Layer Taco Dip Recipe? Let us know in the comments below!